If you ask most engineers, site managers or architects about the advantages and costs involved with air curtains, they probably don’t know for sure, but a three-month-long research study funded by air curtain manufacturer in the USA reveals what we’ve known for some time. Firstly, have you ever considered the use of a vestibule at the entrance to a facility? According to the study, the certified results used computational fluid dynamic (CFD) analysis from second-party research-validation consultant Blue Ridge Numerics, Charlottesville, Va. When compared to conventional automatic two-door vestibules, the study’s results confirmed that an air curtain/automatic door entrance combination is up to 10 percent more energy efficient in environmental separation performance, costs up to 75 percent less in labor and materials, and conserves 50-2,000 square feet of entryway floor space typically consumed by vestibule designs. In this blog, we dig a little deeper and uncover five main advantages of air curtains. Not only does the USA study on Air Curtains highlight that building owners save more energy by installing an air curtain over a vestibule, but air curtains also can reduce the initial construction costs, and maximise floor space. Air Curtains are easy to install and sit neatly at the top of the doorway. Air curtains use less supplemental heat than vestibule heaters; they help enhance employee comfort, and reduce liability by maintaining drier entryway floors during inclement weather. This helps keep traffic flow unhindered, and improves sanitation by reducing insect entry as well as keeping out dust and odours. 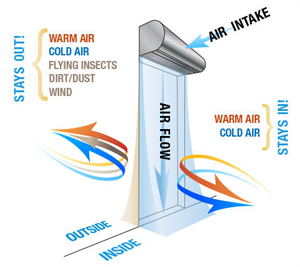 Air curtains consume electrical energy during their operation, but can be used for net energy savings by reducing the heat transfer (via mass transfer when air mixes across the threshold) between two spaces. A closed and well-sealed physical door is the ultimate solution in reducing energy loss, but in some businesses which cater to pedestrians coming in and out, often, throughout the day, the benefits of a physical door are lost. Tasked with cooling /heating a space with a lot of customers/clients coming through the door, air curtains actually lead the way in energy efficiency in many regards. Air Curtains allow the doors to remain open for longer, inviting patrons in off the street, they also allow for much of the conditioned air inside the building not to escape outside. At times, both an air curtain and physical door are often utilized in tandem; when the solid door is opened the air curtain turns on, minimizing air exchange between inside and outside. When scoped to meet your particular door size and environment, Coldshield Aircurtains by Remax in Australia can be used to effectively reduce up to 80% of energy loss through the doorway. An air curtain may pay for itself in a few years by reducing the load on the building's heating or air conditioning system. 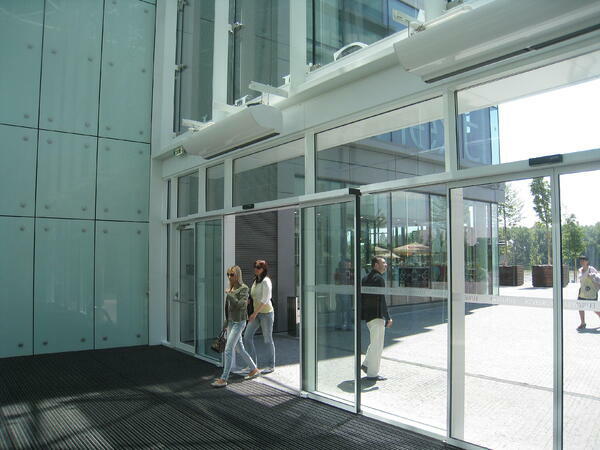 Air curtains provide an unseen barrier, without deflecting from the design of the building, providing an unobtrusive barrier against outside elements. Air curtains are especially effective in areas where doors are left open for long periods, or have to open consistently throughout the day, or even over an entrance which needs to be kept open for operational purposes. Not only are they useful at the main entrance, but they have also been installed within businesses such as the entrance to packing areas / food preparation areas or the internal doorway within a large meatworks. Consider the environment where the air curtain will be used as there are many air curtain options available such the standard Coldshield Air Curtain measuring from 900L x 230W x 235H (mm) up to 1800L x 230W x 235H (mm). 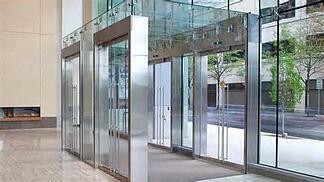 As well heated air curtains and an industrial air curtain for larger areas. The culmination of energy and construction savings adds up to a potential one to three-year payback for an air curtain in comparison to a more permanent and costly construction option. 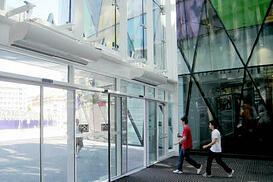 Coldshield air curtain are cased with a powder coated aluminium casing that is easy to clean. 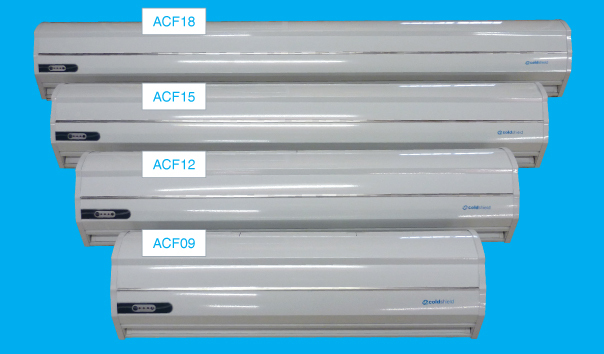 The centrifugal fans of Coldshield air curtains are of industrial quality, producing high air flow with minimal noise. Affordable and competitively priced. > Download the Coldshield Air Curtain Brochure here. Heated Air Curtains are ideal for creating a wall of hot air to minimize the loss of heat from within premises in winter. In summer it hinders hot air from entering the cooled premises. They can also assist in keeping out undesirable elements such as dust, flying insects and exhaust gas. > Download the Heated Air Curtain Brochure here. The Mena House Oberoi Resort & Hotel in Cairo, Egypt, utilizes air curtains not only over the main customer entrances, but also their food preparation and “back of the house” storage areas. The resort has eight 20 x 20 foot freezers that need to hold their temperature during the loading and unloading of their restaurant provisions. The required operating temperature for food safety is minus 21 degrees Celsius (-21°C) (or minus 5.8 degrees Fahrenheit (-5.8°F)) in the freezers. When the freezers were opened for stocking, the freezer temperatures would warm up to negative two degrees Celsius (-2°C)/ 28.4 degrees Fahrenheit (28.4°F), a 19 degree warming differential. After loading, it would take two hours for the temperature to cool back down to the required negative 21 degrees Celsius/ (-5.8°F). The hotel needed a viable solution to conserve and improve their energy usage during their stocking process, as well as maintaining its commitment to the highest food safety standards. Plastic strip curtains are a solution often put forward by cooler manufacturers and food service design consultants. Unfortunately, plastic strips are rendered completely ineffective when they are moved aside to pass through, or positioned over or behind the door while employees go back and forth with delivery equipment. Air curtains offer full protection every time the cooler or freezer door is open, allowing employees to move freely, and since they are invisible, offer an aesthetic and safety appeal that plastic strips cannot.